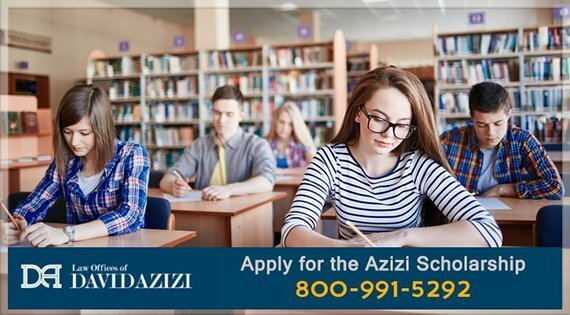 At the Law Offices of David Azizi we know how difficult it is to be able to pay for a law school education today. Working hard and having the ambition to do what is necessary to succeed are core traits. For many, securing a scholarship can make it easier for law students interested in personal injury law to dedicate themselves to their studies without additional worries. For that reason, David Azizi is providing a scholarship for those currently enrolled and attending Southwestern Law School as a law student. Personal injury attorney David Azizi understands the long hours spent learning the law. He also knows that same passion students today feel about the law. David received a small scholarship during his years at Southwestern Law School, and it was, according to him, “amazingly helpful.” After over 21 years of practicing personal injury law in Los Angeles, Beverly Hills and Riverside, David wants to pay forward the help he received to today’s students. To do that, he has established the David Azizi Scholarship. $2,500 to one chosen student. Applying for the scholarship is simple and can be done below. This $2,500 scholarship can be used to help pay law school tuition or for anything you need during these years. David understands how hard it is to make ends meet when attending law school. If you are a currently enrolled student at Southwestern Law School, the David Azizi scholarship is available to you. One winner will be selected by David Azizi to receive the $2,500 scholarship award based upon essay entry. Essay responses should be a minimum of 500 words. Why do you want to specialize in personal injury law after graduation? The $2,500 scholarship award will be based on the essay. It is important that all content in the essay is original. The deadline for applying is: March 7th, 2018. The scholarship will be awarded before the spring semester each year. The winning essay will be published on the the Law Offices of David Azizi website. This will provide readers with information, educating them in personal injury law topics. David believes knowledge and understanding help clients navigate through these difficult times of injury and upheaval in their lives, as reflected in the pages of his website. If you have any questions about the scholarship, please call (800) 991-5292. We wish all our applicants the best of luck here and in the years to come.